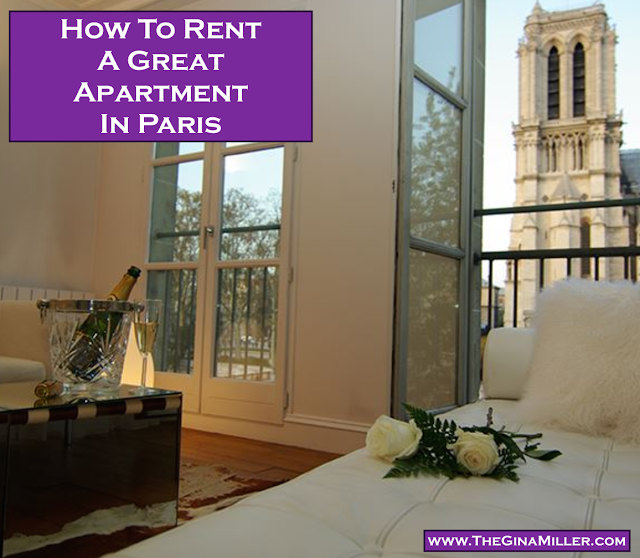 How To Rent A Great Apartment In Paris | Gina Miller's Blog - A working mom's blog about fitness, travel, handbags & beauty. Renting an apartment in Paris is a smart if you will be there for an extended period of time or want the flexibility of cooking your own meals and doing laundry. You can usually get more space for a better price than you would pay for a hotel room. Do you charge for electricity? Do you offer maid services? Do you have air conditioning? Many don't. If it's a hot summer, you will suffer. What time can I get into the apartment? What happens if I lose the keys? Do you have an emergency service if something breaks? Do you allow children? Some don't. Will you offer an apartment walk thru to show me how to use the unfamiliar Parisian appliances? Will you provide concierge services: help with side trips, reservations, etc? Are the photos online a fair representation of the apartment? (During our November 2014 stay the photos did not accurately represent the apartment. It was awful). When were the photos taken. We decided to go the rental route for our 10-day Paris trip in June 2013. I am an avowed hotel lover. I love the romance, nostalgia and luxury of a classic hotel. That luxury doesn't come cheaply, particularly in Paris, so we opted for the space and practicality of an apartment. I ask friends who had rented apartments in Paris. They suggested all the usual suspects: VRBO, AirBNB, Homeaway, Haven in Paris, etc. I consulted Travel and Leisure magazine's awards issue and saw they suggested Guest Apartment Services for Paris apartments. After much research, wrangling and debate, we decided to go with Guest Apartment Services. I like the gorgeous and hip options Haven in Paris offered but Guest Apartment Services fit our location and pricing needs better. 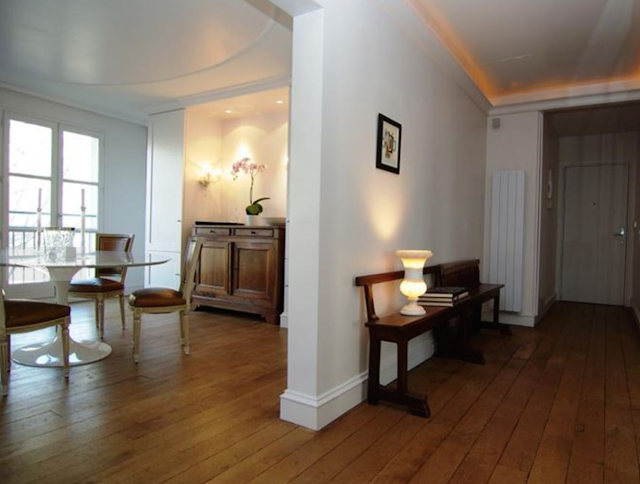 We settled on their Narcisse apartment, a classic 700-square foot beauty on the Ile St. Louis. A great location, a gorgeous space at about $250, give or take, a night for a 10-day trip. Done! Approximately two weeks before our trip, we received an email from Christophe, one of Guest Apartment Services owners, who informed us that there would be renovation work on the building during our stay. There would be scaffolding surrounding the structure and noise from 8am until 5pm every day. Not great if you have a baby. He offered us an "upgrade" to Snowdrop, a sleek, contemporary 754-square foot unit right across from Notre Dame, located in an apartment building at 19 Quai de Montebello. We hemmed and hawed. We didn't know the neighborhood as well and, according to the map, it looked to be right on a busy street overlooking the Seine River. We worried about the noise keeping us awake at night. We stuck with it because, as I learned, summertime apartments in Paris are a tough get. Wondering about day trips from Paris? How does Champagne sound? Here's how to get to Champagne. Chic, fabulous and well-situated. It was also large enough to accommodate two adults and a baby with a sufficient kitchen that allowed us to brew coffee, have breakfast and enjoy the morning. The location was perfect. We were within walking distance from about anything we wanted to visit. If we needed to take the Metro, we were a five minute walk from the Saint Michel/Notre Dame station. We loved watching the street theater that is the Paris rues from our window. We had champagne with our balconies open and enjoyed the inline skating street performers at night. The police would run them off and they would return 10 minutes later. The noise was not a factor as the windows were double-paned and blocked it. There was a Subway sandwich shop right below us that was having work done. This turned out to be an unwelcome alarm clock on some mornings but it wasn't too bad. That Subway "bread" smell was an almost unpleasant reminder of home, though. I also worried about the lights and noise from the barges touring the Seine. This was never an issue. Our bedroom was in the back, facing a courtyard and completely insulated from the Seine-facing windows. We slept fine. It was an outstanding decision. The only downside, for us, was the lack of daily maid service. This is the high maintenance me come out: I like a clean place. Staying in apartment with an 18-month old had me cleaning up the crumbs she would inevitably drop every morning at breakfast. I also did a fair amount of laundry while there. Guest Apartment Services offered two complimentary hours of maid service per week. We could have paid for more. I didn't and just spent the 20 minutes a day tidying up the place. No big deal. I would rent from them time and again. I love that they were proactive in informing me there was work being done on our original apartment choice. They stayed in contact with us throughout the trip to ensure our needs were met. Spend time doing homework and researching options. Ask friends, consult websites, blogs and magazines. Determine a central location that you want to serve as your home base for your stay. That is a good starting point. Find something that fits your aeasthetic. See if the service's style "feels" right. Each service offers something different: classic, contemporary, budget, luxe. Google the service. I read review upon review of Guest Apartment Services. Each one was effusive in praising the company. Love Paris, France and beyond? Of course you do. Check out my new website, Fab French Finds, which focuses on Paris, France and beyond. 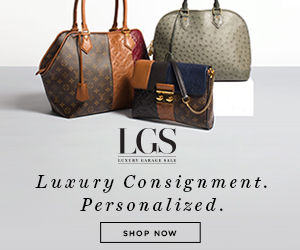 It features a travel tips and a curated selection of authentic French products and chic Paris-themed items. Sign up for our Fab French Fridays newsletter. You will receive a weekly email, generally on Fridays (bien sur), full of French travel tips, news, recipes and other goodies to help you plan a trip or simply help you satisfy your Francophile wanderlust.